Today’s post is by Peppercommer Jackie Kolek. Let’s face it, traveling these days stinks. Whether it’s for business or pleasure, by plane, train or automobile, the experience is fraught with frustration. In the last week I had one day where I spent three hours trying to get to the airport in a blizzard because United refused to cancel my flight, only to have it cancelled and be forced to spend another three and a half hours getting home. Earlier this week both my Amtrak trains to Boston were cancelled due weather-related delays. It was the first day it had broken 35 degrees in weeks and there was no rain or snow in sight. Bottom line, anyone reading this likely has multiple road-warrior stories that he/she could share and which resulted in pain, anger and frustration. That’s why I applaud Air New Zealand and Delta for their fun take on airline safety videos. 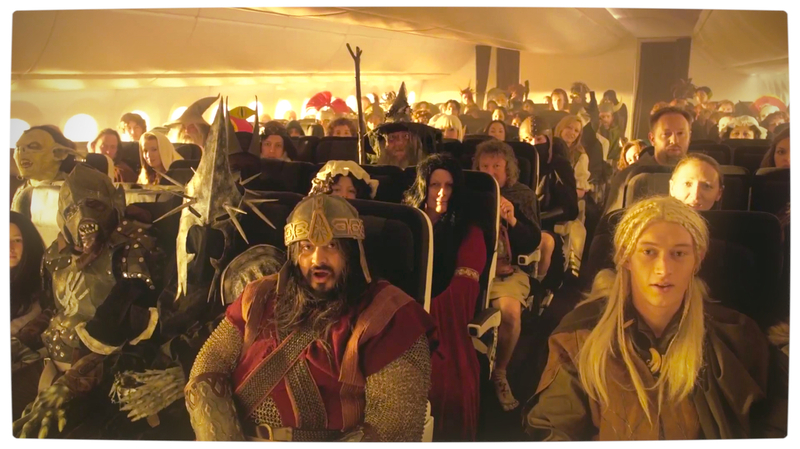 Air New Zealand broke new ground with their hilarious Hobbit-themed safety video (complete with Gandalf in the cockpit and hobbit feet under the seats) and a follow up Old School version featuring Betty White and Gavin McCloud. But to me, Delta’s new 80’s themed video is a stroke of genius. The cameos by ALF and Kareem Abdul Jabbar totally resonate with today’s 40-something business traveler who remembers well the days of big hair and Whip It. More importantly, the videos make people sit up and actually take notice. I can’t remember the last time I paid attention to one of these, even when I am traveling with my children. But the 80’s icons would make me look up and listen. This video is a great example of how comedy, when used in the right way, can enhance even a serious message, engage audiences and make a lasting impression. Finally, during a time when air travel is suffering from a true reputational crisis, this attempt to lighten up an otherwise dreadful experience is a smart move. The use of humor has certainly changed my perception of Delta and brought back the notion of flying the friendly skies (even if that particular tagline belonged to United, which is anything but). For my next trip I’ll certainly put Delta at the top of my list. Way to Whip It! I witnessed a Millennial display plenty of courage in a recent informational interview with me. I liked that. She immediately came across as a peer and not some immature, unprepared job prospect. Then, instead of the usual, banal responses to my question asking why she wanted a career in PR (i.e. “I like people” or “I, like, so want to manage special events and parties,”) this candidate first briefed me on her relevant experience. She went on to address the importance of her MBA in both enabling her to read, and understand, a balance sheet. She noted that the MBA enabled her to have a much better understanding of PR’s role within the marketing mix, and would be open to working with any agency or client that respected PR’s lead role in engaging audiences. Wow. I’ve asked her to come back for a second round of interviews at my firm, and I’ll be brokering a few introductions to others on her behalf. Why? Because she displayed grace under pressure. Job-seeking Millennials, Gen Xers and Baby Boomers alike need to better understand the importance of courage in an interview setting. It sure differentiated one job seeker. And, for the record, while I still can’t define the word, I know I just saw a nonpareil performance of courage in the workplace. New Jersey Transit and print advertising are two of my least favorite things. The former is synonymous with horrific service. The latter plays a marginal role in creating awareness but, in reality, does little more than annoy the average consumer. So, imagine my personal, perfect storm when I spied a godawful print ad that inadvertently reinforced my hatred of all things NJ Transit-related. It happened the other day when I was stuck on yet another train. The earlier ones had been cancelled (“overhead wiring issues”) and mine would be making all local stops. It was filled with passengers packed together LIKE sardines AND boasted a temperature humidity index that would rival any hot yoga class. That’s when I saw the ad. The copy went on to suggest the marketer, Prudential Securities, was great at identifying instincts such as yawning. And, wouldn’t you want your banker attuned to such subtleties when managing your investment portfolio? Talk about the wrong ad in the wrong place at the wrong time! Whoever bought the NJ Transit space should be sent to an advertising version of Gitmo for waterboarding. New Jersey Transit riders are worn out. Their jobs fatigue them. And, their commute beats the hell out of them. So, why on earth would Prudential uses yawning as a device to tell their story? Talk about pouring salt on the wound. 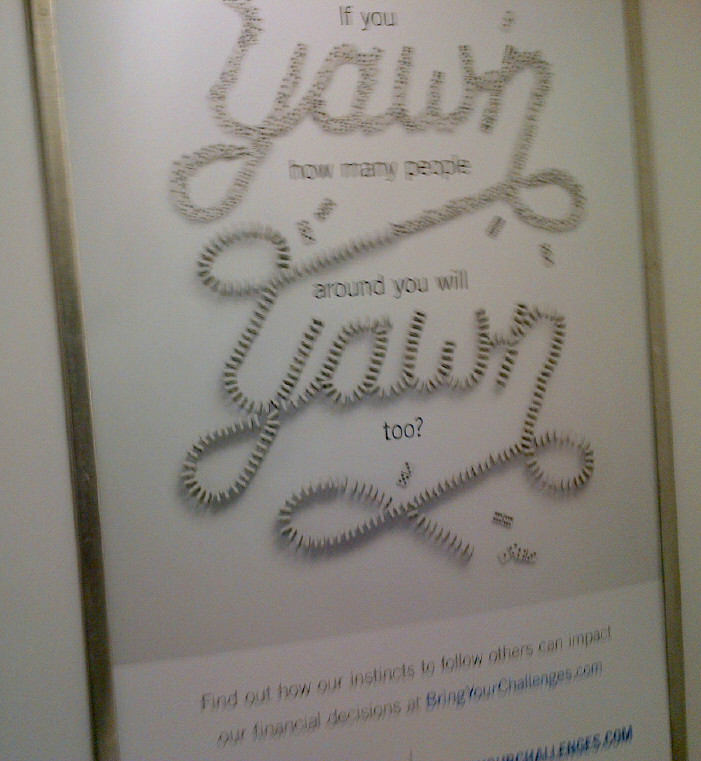 The Yawn ad is a textbook example of a brand NOT listening to its target audience. If Prudential HAD taken the time to study the wants and needs of NJ Transit commuters, they’d have known not to reinforce a negative emotion AS the negative emotion is occurring real-time. 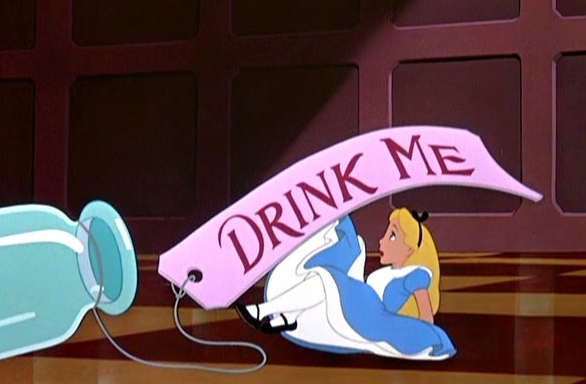 I’ll tell you one thing. I’ll never, ever consider Prudential Securities. Not after their print ad made me feel this way. And, I’ll bet thousands of fellow passengers felt the same way (assuming they weren’t yawning, or sleeping) during the ride). There’s nothing Olympian about the U.S. team’s uniforms. Have you seen the Team USA uniforms for the upcoming winter Olympics? 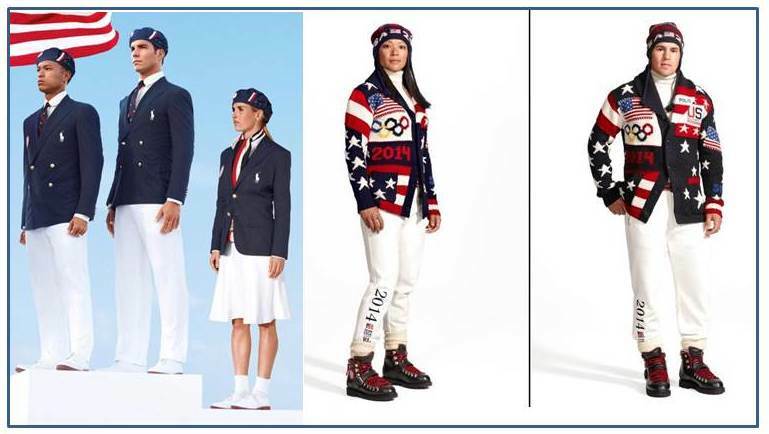 Apparently Ralph Lauren (nee Lifshitz) took to heart the criticism received over the neo-Germanic outfits, (punctuated by Cousin Eddie’s shoes,) he designed for the 2012 summer games. For starters, they were made in China. And B, they were made in China. But maybe worse of all they sported Ralph’s trademark horsie – supersized, as if the American way. In case you’ve blacked out the image from your memory, allow me to refresh (below left). So this time, (above right) Ralphie assembled his best blind quilters and came up with the horse blankets pictured here. But they were made in the US. Kind of burns your eyeballs, no? And what’s with the pants? Look as if they belong on a hospital orderly. And in place of his horsie logo, there is his favorite word: Polo. When will he quit? And, the models look pretty uncomfortable. But that could be because they know there’s a bulls-eye on their back— the teams have been admonished to not wear these frocks when they are “away from competition.” But maybe that’s good news after all. The less these craft store explosions are seen the better. But of course that is just one of the problems facing these ill-fated winter games. But that’s for another post… back to the topic at hand… what do you think about the uniforms? I realize we live in a dumbed society inhabited by the likes of Honey Boo-Boo and Dog the Bounty Hunter, but are Americans so naïve they need to be protected from native advertising? The ad speaks to the health benefits of staying hydrated throughout the day, but it also identifies a problem: 20 percent of Americans don’t like the taste of water. The solution? Four varieties of Shape Water Boosters: Beauty, Wellness, Slim and Energy, guaranteed to make your water more tasty. To which I respond, gimme a break. While the page may indeed be headlined: ‘Live Healthy News,’ it’s clearly an ad. In fact, the accompanying photograph could be used to adorn the cover of a college textbook on the subject of advertising. It’s that obvious. I admire the efforts of such groups as the Federal Trade Commission, the Word of Mouth Marketing Association and the National Advertising Division. But, methinks they’re taking things a tad too far. Honey Boo-Boo and Dog the Bounty Hunter notwithstanding, I remain convinced the average American is still smart enough to tell the difference between an ad and editorial copy (especially when it’s as obvious as the Shape example). And, if a company really does blur the lines in blatant, deceptive ways, let’s turns the FTC watchdogs loose to do their thing. I simply couldn’t resist picking up a book that compared mountain climbing with business leadership, especially one that featured a foreword by legendary Duke basketball coach Mike Krzyzewski. I must say Alison Levine’s ‘On the Edge: The Art of High-Impact Leadership‘ is a page-turner that contains as many unexpected twists as the summit weather on Mt. Washington. Levine inhabits both the business and climbing worlds. She began her career as a Goldman Sachs trader and today delivers some 150 speeches a year. 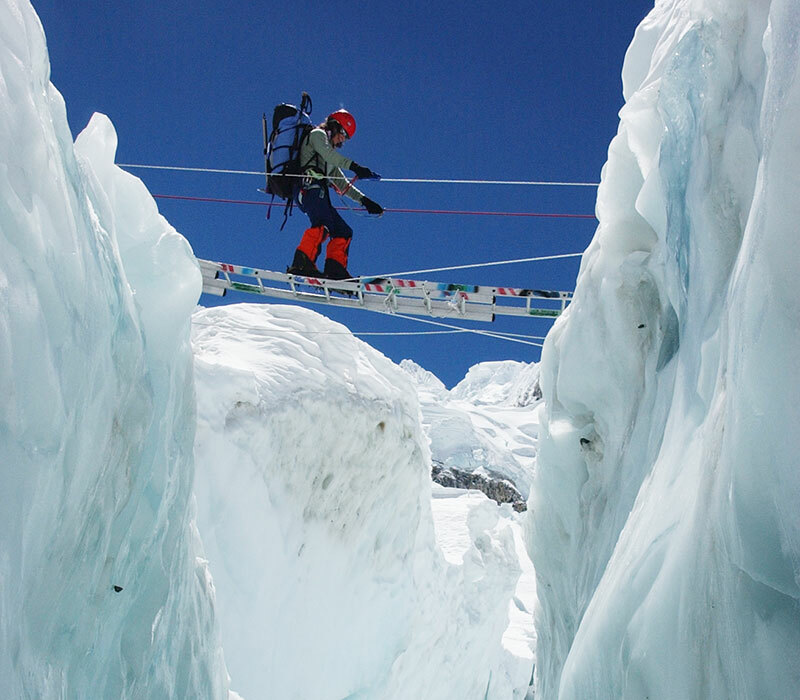 She’s also topped out ALL Seven Summits as well as skied across the North and South Poles. And, get this, she also suffers from a heart condition. I got winded just writing that last paragraph! – Believes one should practice sleep deprivation, since leaders will inevitably have to face long, crisis-filled days and nights. The more your body acclimates to sleeplessness, the better you’ll respond in crisis (note: I periodically practice sleep deprivation. But, I assure you, it’s NOT done on purpose, or to prepare for a crisis.). 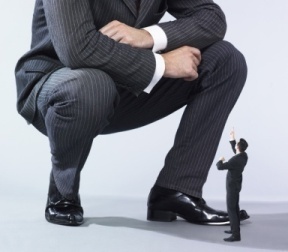 – Ego is a great thing, and the best leaders should surround themselves with strong egos. I agree. Passive, yes-men (or women) can destroy an organization. Smart, self-assured egos who ‘play’ together can form an unbeatable team (Think: Coach K’s various gold medal-winning Olympic basketball teams). 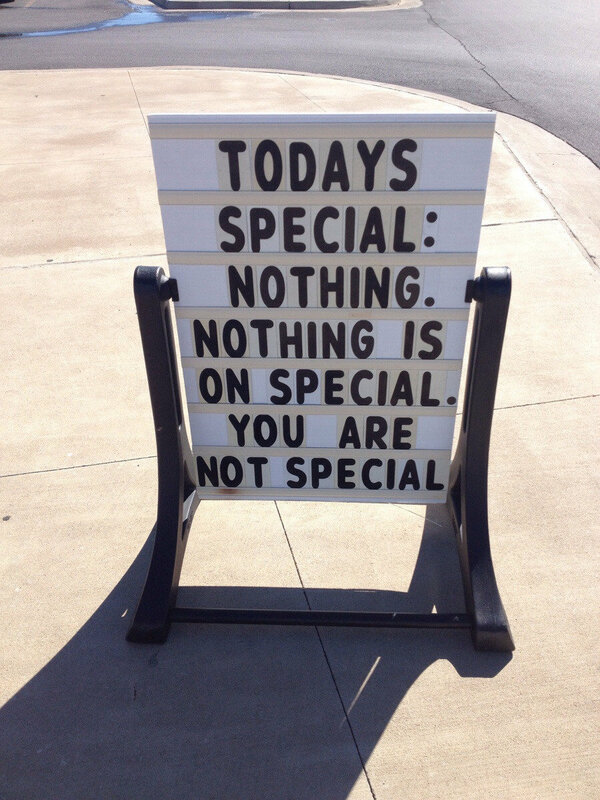 – You’re not special. I know I’m not. I know I need smart, strong leaders and managers to help run Peppercomm. Climbers (and stand-up comedians) also know they’re not special. Each may harness an inner resolve when they climb or perform, but both are amazing team players. Comedians are incredibly supportive of one another before, and after, a performance. Ditto with climbers. Business executives not so much. Levine says the best leaders know they’re part of a team and, ultimately, can be replaced. Last, but not least, Levine and Coach K both share the same belief: A person cannot control the environment, but only his or her reaction to it. That is SO true. While we try our best to carefully plan Peppercomm’s future, we also know a long-standing client could hire a new CCO tomorrow, and we’d be fired. And, while comedians can carefully rehearse their A-material, they cannot control an out-of-control (or worse) indifferent audience. And, it goes without saying that avalanches, rock slides and horrible weather have ended many a climber’s best-laid plans. I highly recommend ‘On the Edge’. It’s an ideal primer for college graduates about to enter the workplace as well as those grizzled veterans who think they’ve seen it all. There are many insights to be gleaned, including the most important of all: you’re not special (and need to be fully supportive of your team). Today’s guest post is by WALEKPeppercommer Stefan Prelog. Minutes after the NFC Championship game between the San Francisco ‘49ers and Seattle Seahawks ended, a collective “so what” could be heard around the country. Sure, Peyton Manning and Denver’s high-powered offense going up against Seattle and their bruising defense would make for a great matchup. But for the casual observer, Super Bowl XLVIII didn’t have much pizazz besides wondering how much snow there would be in the Meadowlands. Enter Richard Sherman, the Seahawks cornerback who got his fingertips on a ball meant for ‘49ers receiver Michael Crabtree and forced an interception that secured the Seahawks victory. After the game, Fox sideline reporter Erin Andrews asked Sherman about the play and in seconds he turned casual fans around the country into talking heads on the state of sports and society. “Great — thanks Richard Sherman! Now I feel in need to root for Peyton and @Broncos. Thanks a lot,” was one response on Twitter . 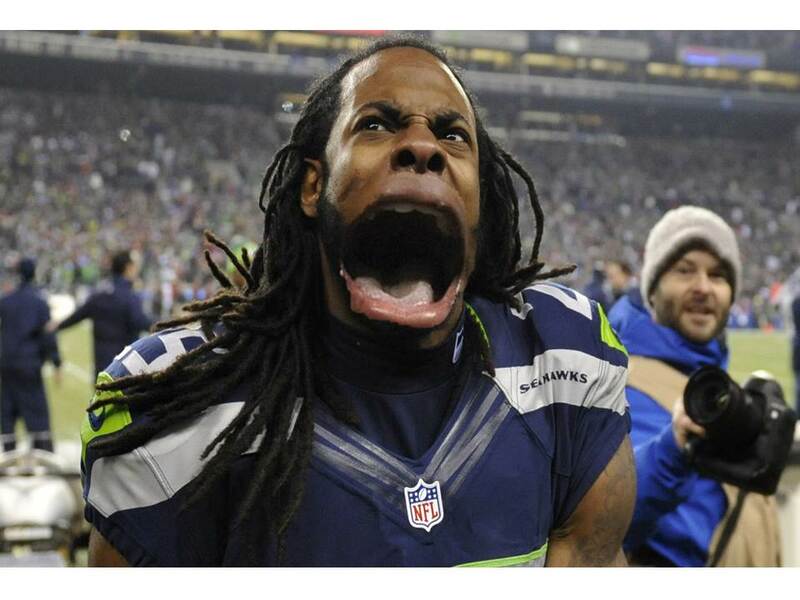 The Twitter-sphere lit up with comments about Sherman’s outburst against Michael Crabtree. Everyone wanted to weigh in and talk about Sherman’s trash-talking post-game interview. It didn’t matter what Crabtree had said or what the history was, the Super Bowl had a new loudmouth to love or hate. In an instant Sherman became this year’s Randy Moss, Chad Ochowhateveryournameisnow or Michael Irvin—and that’s not a bad thing. Would it have been as interesting to hear Sherman say, “I was fortunate to make that play. We worked hard all game and I was thankful I had a chance to secure the win for me and my teammates. It was a true team effort?” We hear stock quotes like that all the time. In a culture where public relations professionals and spokespeople work to ensure that nothing interesting comes out of the mouths of professional athletes, it’s refreshing to hear someone react and say exactly what’s on his mind. Sherman followed up his live rant by penning a column for Sports Illustrated. It’s a fascinating read and a rare look into the psyche of a professional athlete, but one quote in particular stands out: “To those who would call me a thug or worse because I show passion on a football field—don’t judge a person’s character by what they do between the lines. Judge a man by what he does off the field, what he does for his community, what he does for his family.” While that’s great insight, the media and fans everywhere already judged and made up their minds on Richard Sherman’s character. Sports teams are a lot like companies, they don’t want their employees spouting off and saying things that might damage their brand. (Cue Barry Diller nodding his head). So when we get a little bit of honesty it cuts through the clutter like a Peyton Manning pass. A player or coach sharing actual thoughts is rare, but when it happens it’s ratings gold. Unfiltered, off-the-cuff comments are dissected, analyzed and debated by sports commentators and anyone with a Twitter handle for days, weeks even months and with social media some of them live in infamy. Sherman turned a lot of people off with his bravado, but the NFL and Fox surely don’t mind. By simply speaking his mind he became the most talked about figure of the most talked about game of the year. Want to guess which player not named Peyton Manning will have the most reporters clamoring for an interview on Super Bowl’s media day? Richard Sherman was simply being real. How’s that for a branding strategy? Repman readers know I have a passion for customer service, good, bad or ugly. So, I do my best to keep current on what defines superior customer service (since it’s such a scarce commodity). Well, it turns out four Peppercomm colleagues have taken it upon themselves to curate their own customer service magazine on Flip. In just three short months, they’ve created a treasure trove of content, ranging from an Inc. article defining customer service to another one in Forbes providing tips for creating a great BtoB customer experience. The Flip magazine created by Ted, Dmitriy, Laura and Sam already contains 60 articles that one can slice and dice by subject. How cool is that? – Positioned themselves as thought leaders since they read and consume so much content on the subject. Flip makes perfect sense for any PR executive who wants to rise above the fray and become a true subject matter expert. It’s also ideal for ANY college student looking to make an impression on prospective employers. Imagine the impression one would make after creating a personal magazine that contains 60 or so articles on a given subject and then flipping through it on a tablet during an interview. That’s what I call a differentiator. I’ll leave it to you to flip over Flip. You can check it out @ www.flipboard.com. Seven habits for effectively managing down. Like Repman, I also receive updates from Leadership IQ. “Managing Up” struck a different chord for me however. Let me get to the point. If you can’t manage down, don’t bother managing up. Across large and small employers, I can think of supervisors that spent 80% or more time managing up and 20% or less time effectively managing down. And those appear to be my colleagues who always struggle to stay with the same employer. Their dysfunctions don’t stay secret for long. Managing down doesn’t demand a Leadership IQ seminar to do it right. On the other hand, I’m not the best manager I’ve met. I read a lot about good ones and sadly witness a lot of bad ones. So with that experience, my 7 habits for effectively managing down follows. I know few of these thoughts are original. But, I also think most of them work. 7. Make sure your team is aligned on the goals of the month, the quarter and the year. Everyone who works for you should articulate that on cue. If they don’t know, or have different interpretations, that’s a problem. This is easy to do and liberating for any leader. 6. Make sure each person on your team knows exactly what they should be contributing to achieve those goals. It’s not just a to-do list or a job description. It’s their broader responsibility to help get the group to the finish line. And repeat it all the time. It’s far worse to be non-directional than it is to sound like a broken record. 5. Smile when your team members walk into your office. Always. Go to their office once a day to ask what’s going on. Always. 4. Let people know where they stand. If they’re great they should know it, and so should everyone else in the office. If they’re weak they should know it, and understand what skills they need to sharpen. 3. If you have team members that keep getting better, promote them. If you have team members that keep deteriorating, wind things down. Quickly. It’s more compassionate for everyone than it sounds. 2. Think about ways to stretch your good players further with new ideas all the time. You never know when that will (and it WILL) lead to a major business win. 1. Be clear, candid, constructive, collaborative, and kind. I think this works for most people I know. I think it works for me. I would love to hear your thoughts. I routinely receive updates from a firm called Leadership IQ. I’m not sure how I got on their list, but every now and then, one of their topics strike a chord. The invite explained that Managing Up ‘…is about understanding our bosses’ strengths, weaknesses (I have none, BTW), goals, styles, and needs so that we can make them, and us, amazingly successful.’ Talk about a pronoun-heavy promise. Wow. – Understand the four communication styles bosses use (I doubt I use any style at all. I’m a clumsy boss.). – Three steps to deliver bad news to your boss (I prefer one, very short step: “Steve, I have bad news.”). In my century-long career, I’ve worked for many types of bosses. Some screamed. Some spoke in Byzantine code words known only to them. Others never explained a damn thing about an assignment. And one did everything possible to undermine my success (There were no tips for dealing with that monstrosity). Some of the stars at Peppercomm have really learned how to manage me. Ted Birkhahn, our president, figured it out when he was a lowly junior account executive about three decades back. He knew I didn’t like to manage in a vacuum (I need to know what’s what). But, he also knew I didn’t like information overload. So, Ted quickly learned to tell me only what I needed to know when I needed to know it. It was a classic example of managing up. The problem with a quick fix, 60-minute seminar is obvious: every boss in every workplace is completely different. Think snowflakes. The tactics I employed to manage my screaming boss were dramatically different than the approach I took with the one who spoke in foreign tongues. I’m a huge believer in lifelong learning, but I can save you 60 minutes right now. If you want to learn how to manage your boss, study her style. Ask peers who have worked with her for advice. 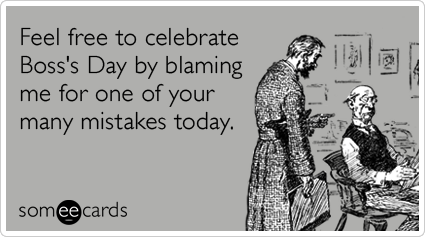 And, learn from your mistakes. Eight generic tips here, and three there, are actually an invitation to disaster. Listening is the only way to go. Listen to what your boss says, and read what he writes. He’ll give you very clear clues on the best ways to manage him. And if he doesn’t, you can always download the Leadership IQ webinar from their website.